Now available free of charge at the iTunes App Store is an app that will give you help finding courses anywhere in the world with course ratings to aid you make your choice. Called the Global Golf Guide & Logbook it is was developed by Yves C. Ton-That author of the best-selling “Golf Rules Quick Reference” and creator of the iGolfrules app. “It’s very convenient to see so many great rounds of golf saved in one spot,” says Ton-That. “Recently I had a friend ask me the name of a course we played near Naples, FL. He was quite impressed when I looked it up in my logbook and found the course name within seconds. He was even more impressed when I tapped on his name in my logbook and five other rounds we’d played together that he had forgot about appeared on my screen”. Golf Guide & Logbook app for the iPhone documents rounds played so rather than buying another logoed golf ball or crested shirt as commemoratives of the day users can keep a log of the experience and store the information on their iPhone. The app also gives them the chance to rate the courses adding to the overall pool of knowledge all users can access and it may be shared directly with friends. The Golf Guide portion of the app contains every golf course in the world wi th contact data, route planning and ratings making it easy to book a tee time while the personal Logbook stores a variety of information such as photos, scorecards, players and results. The amount of information stored is determined by the user who can then display golfing history chronologically or on a map and sort entries by rating, frequency, countries, playing partners, etc. They can also share rounds they’ve played with friends via email, Twitter or Facebook. 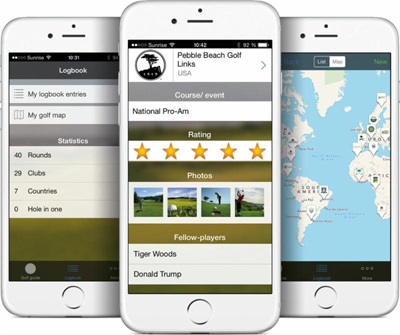 The app stores all the user’s rounds in one place, accessible at any time so all of the great on-course moments are never forgotten. And it’s all free of charge.